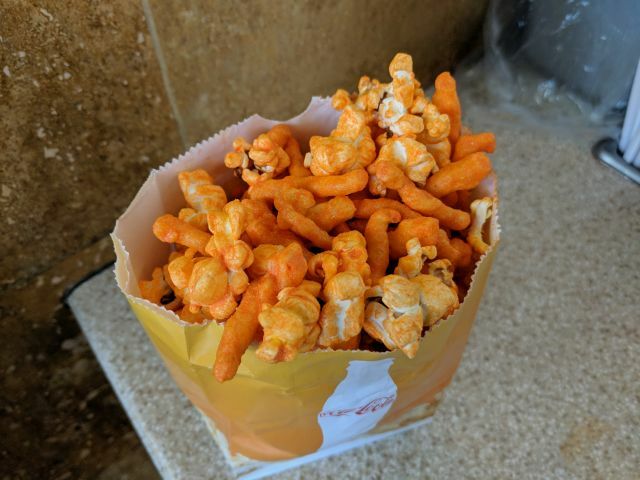 Cheetos Popcorn can be found nationwide at Regal Cinemas and features Cheetos-flavored popcorn mixed with Crunchy Cheetos. A small bag cost me $6.99. Unlike a regular bag of popcorn, Cheetos Popcorn (or at least my bag) comes at room temperature rather than warm or hot. I think maybe it's so that powdered cheese doesn't melt? They spin the popcorn with the Cheetos cheese powder so that there was an even coat on every kernel. 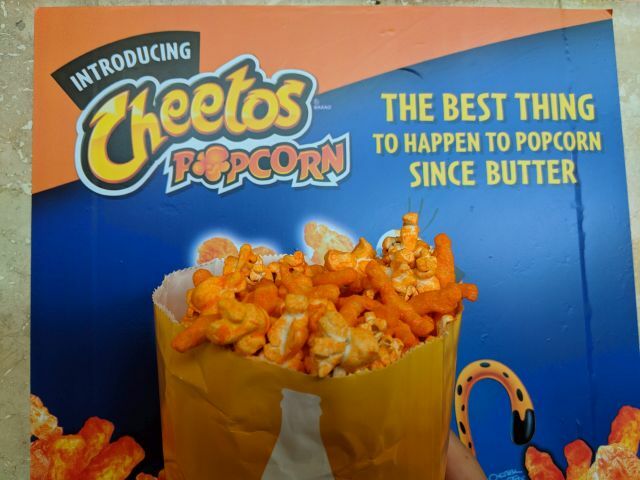 The popcorn delivered a Cheetos-like flavor with a strong note of cheddar, while the Crunchy Cheetos give each bag an extra dose of crunch. Despite the small-sized bag, I found myself getting quite full snacking on Cheetos Popcorn due to the Crunchy Cheetos. I also felt a bit of flavor fatigue halfway through with all the cheesiness. Overall, Cheetos Popcorn hit the right notes in terms of Cheetos flavor and provides a bit of novelty and variety from your run-of-the-mill buttered popcorn.